A team of astronomers, including Carnegie's Benjamin Shappee, Nidia Morrell, and Ian Thompson, has discovered the most-luminous supernova ever observed, called ASAS-SN-15lh. Their findings are published in Science. Supernovae are violent stellar explosions and some of the brightest objects in the universe. Human records noting their existence date back nearly 2,000 years. Within the past two decades a rare new category of super-luminous supernovae have been discovered, which shine one hundred to a thousand times brighter than the more-common supernovae. It has been theorized that these super-luminous supernovae are powered by so-called magnetars, neutron stars with extremely powerful magnetic fields, with the magnetism providing the engine for the immense luminosity. According to this theory, the magnetic field's spin magnifies the energy of the explosion, increasing the luminosity. As counterintuitive as it may sound, super-luminous supernovae are difficult for astronomers to spot. This is because they are rare and tend to form in low-luminosity galaxies with vigorous star formation, whereas the sky surveys that have been traditionally used to locate supernovae target bright galaxies with low rates of star formation. The newly found super-luminous supernova was discovered by the All Sky Automated Survey for SuperNovae team (ASAS-SN), an international collaboration headquartered at the Ohio State University, which uses a network of 14-centimeter telescopes around the world to scan the visible sky every two or three nights looking for very bright supernovae. The only all-sky variability survey in existence, it is capable of finding normal supernovae out to about 350 million light years from Earth. "On June 14 of this year, we spotted a newly occurring explosion in a galaxy of an unknown distance," Shappee said. 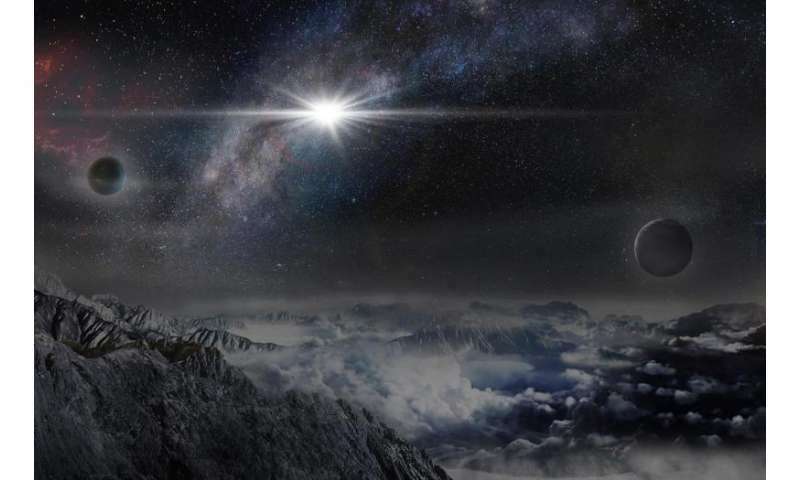 "Subsequent observations—including those made at our Las Campanas Observatory by Nidia Morrell and Ian Thompson—allowed the team to confirm the existence of the supernova ASAS-SN-15lh." The supernova's spectra matched that of other hydrogen-poor super-luminous supernovae. But it wasn't until further follow-up was conducted that the study's lead author Subo Dong of the Kavli Institute for Astronomy and Astrophysics (KIAA) at Peking University and the rest of the team realized how unusual the supernova is. It is two times more luminous than any supernova previously discovered. 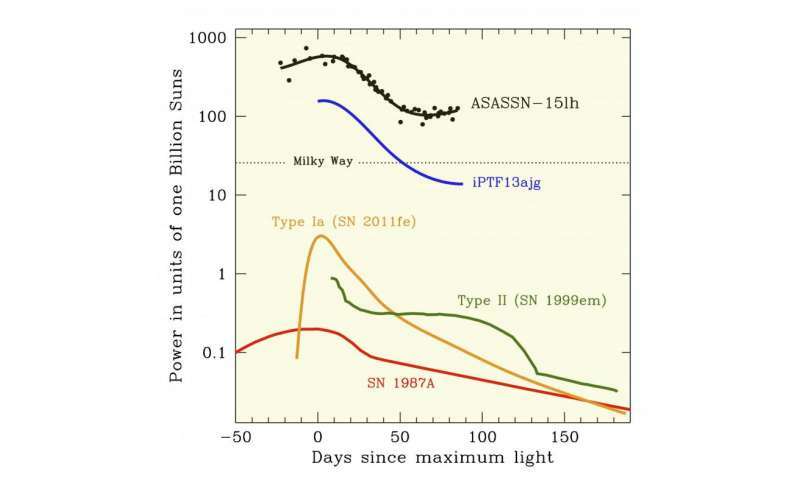 In fact, ASAS-SN-15lh at peak was almost 50 times more luminous than the entire Milky Way galaxy. "When the first du Pont spectrum was available, as usual, I quickly checked what kind of supernova it was. To my surprise, I was not able to even tell for sure it was a supernova. My first reaction was: 'this is interesting, we should get more data,'" Morrell said. "It was only when we obtained higher resolution spectra from the Southern African Large Telescope and the Magellan Clay Telescope that I realized how distant the host galaxy is and consequently, how luminous the supernova." What's more, they determined that the galaxy where ASAS-SN-15lh formed is very atypical for a super-luminous supernova, which raises questions about how these types of supernovae form. Its host galaxy isn't the typical low-luminosity, star-forming galaxy where previous super-luminous supernovae have been spotted. ASAS-SN-15lh's galaxy is, in fact, more luminous than our own Milky Way. "The astounding amount of energy released by this supernova strains the magnetar-formation theory," Shappee explained. "More work will be necessary to understand this extraordinary object's power source and whether there are other similar supernovae out there in the universe." But how distant was it? The article doesn't say. Curiosity demands it. Superluminous Supernova are not "dying stars" - they are Black Holes Exploding! Once the Black Hole explodes it exposes the original core of the original star that became a Black Hole and creates a Neutron Star/Magnetron Star - once the Black Hole has "evolved" through a "Universal Cycle" it pops back up into the Universe it originated in!